When I was in the seventh grade, I wrote an impassioned essay about my hatred of Valentine's Day. "Valentine's Day," I read out to the class. "Is my least favorite day of the year. Anybody who likes Valentine's Day is an idiot. It's just a made-up holiday that big nameless corporations invented so that the mindless masses go out and spend money unnecessarily." Pretty sure that my essay received crickets. Not to mention that, what seemed anti-establishment and rebellious at age 12 actually seems pretty, uh, trite now. To say the least. As for the cake itself, I figured I'd attempt another try at recreating the perfect red velvet cake recipe I had a few years ago in New York City (because red velvet = red = love = Valentine's Day...? Or something). 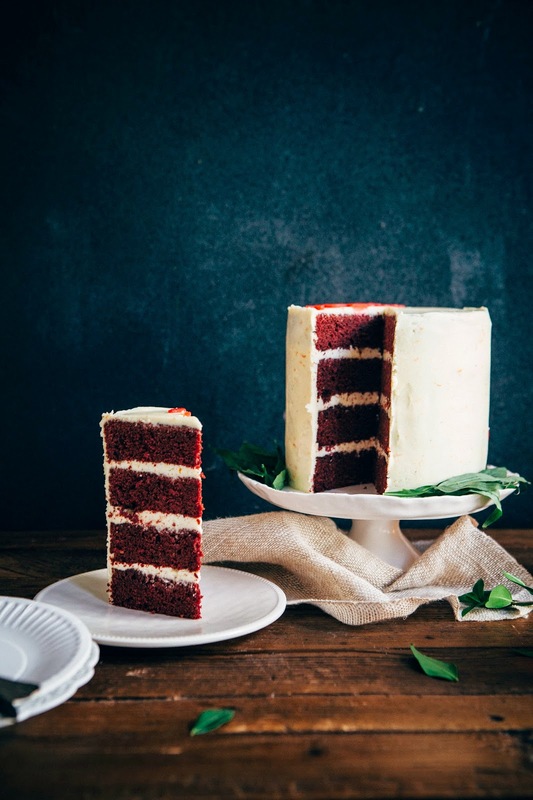 But anyway, this recipe is the closest yet that I've come to recreating that memorable red velvet cake yet: a cake with a dense and moist crumb, with a deep velvety and almost chocolatey flavor accompanied by a bold, dark red color. However, the cake does have one weak spot: its frosting. Although red velvet cake is traditionally served with cream cheese frosting these days, the perfect cake I had in New York was served with some sort of incredibly light and creamy orange-scented buttercream frosting. I haven't had a buttercream frosting yet that's come close to it. 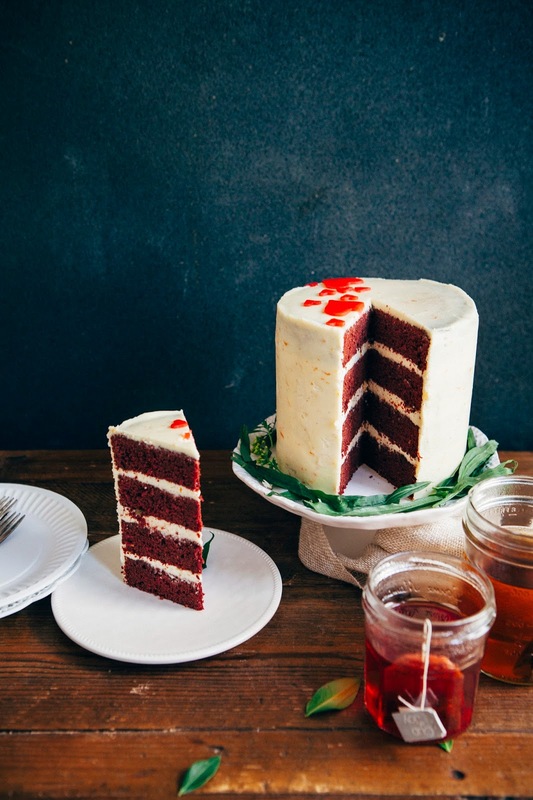 BUT I did find through my research (ehem, Google and reading New York Times cooking articles) that the original red velvet cake from the 1940s was served with something called ermine frosting, or boiled milk frosting. The frosting instructed you to make a pudding from milk and flour, before whipping it up with butter and sugar to create an incredibly light and fluffy frosting. And by light and fluffy, I mean light and fluffy — think of the soapiest bubble bath you've ever taken and imagine that those foamy soap suds are actually edible. That's the texture of ermine frosting. While it was cool to serve the cake with a historically significant recipe, I still think the cake would have been better balanced out with a tangy, citrusy cream cheese frosting. Oh well. For next time! P.S. My incredibly talented photographer friend Celeste took some behind-the-scenes photos of me cutting, styling and playing around with this cake — check it out on her blog! Although I made this recipe in four 6-inch cake pans, you can turn it into a three layer cake instead by using three 9-inch cake pans. Shorten the baking time by 10 minutes to 25-30 minutes. Because this cake uses a lot of red food coloring, I suggest using a red food coloring gel as opposed to plain old red food coloring dye. In my experience, gels tend to disperse color more evenly throughout the batter and you end up with a more vividly colored baked good. I also think that gels taste less artificial than dyes, but that one might just be in my head. I used these cookie cutters for the larger hearts and a cutter from this mini cookie cutter set for the smaller hearts. Center a rack in the oven and preheat to 350 (F). Prepare four 6-inch round cake pans by spraying generously with cooking spray and lining the bottoms with parchment paper circles; spray the parchment paper with cooking spray. In a small bowl, combine 2 cups granulated sugar with fresh zest from 1 medium orange. Use your fingers to incorporate the zest throughout the sugar, rubbing the zest into the sugar. This will help release oils from the zest that will infuse your sugar with more flavor. Set aside. In the bowl of a freestanding electric mixer fitted with a paddle attachment, combine sugar (from the 2nd step), 2 1/4 cups all-purpose flour, 1/2 cup plus 3 tablespoons natural unsweetened cocoa powder, 3/4 teaspoon baking powder, 3/4 teaspoon baking soda and 3/4 teaspoon kosher salt. Beat on low speed for around 30 seconds to blend the ingredients together until fully combined. In a large bowl, whisk together 1 cup melted unsalted butter, 3/4 cup buttermilk, 2 large eggs, 2 large egg yolks, 1 teaspoon pure vanilla extract, 1/2 teaspoon pure orange extract and 1 tablespoon red food coloring gel until just blended. Add the liquid mixture (from the 4th step) to the flour mixture in 2 batches, beating on low speed until blended. Once the liquid mixture has been added, increase the mixer speed to high and beat until smooth, no more than 30 seconds. Reduce the mixer speed back to its lowest setting and slowly pour in 3/4 cup boiling coffee. Be careful not to overmix! Beat until the coffee has just been blended, and the mixture turns into a dark maroon, almost brown color. The batter will be thin. Divide the batter equally among the prepared pans and bake in the preheated oven for 30 to 35 minutes, or until a skewer inserted into the center of each cake comes out clean and the tops of each cake bounce back when gently touched. Transfer the cakes to a wire rack to cool for 15 minutes, before turning them out to cool completely. Remove the parchment paper and prepare the frosting only when the cakes have completely cooled and you're ready to start frosting the cake. In a small bowl, combine 1 cup granulated sugar and the fresh zest from 1 medium orange. Use your fingers to incorporate the zest throughout the sugar, rubbing the zest into the sugar. Set aside. Combine 5 tablespoons all-purpose flour and 1 cup whole milk in a medium, heavy-bottomed saucepan over medium heat. Continue heating until the mixture simmers, whisking frequently until the mixture thickens and becomes almost pudding-like. The end result should be a thick, white paste. Once the mixture achieves this texture, remove from heat and whisk in 1 teaspoon pure orange extract and a pinch of salt. Use a rubber spatula to transfer the mixture to a bowl to allow it to cool completely. Put plastic wrap on the surface of the pudding to prevent a skin from forming. Once the mixture has cooled completely, combine 1 cup unsalted butter and 1 cup orange-scented granulated sugar (from the 1st step) in the bowl of a freestanding electric mixer fitted with a paddle attachment. Cream the butter and sugar together on medium-high speed until light and fluffy, scraping the sides of the bowl occasionally, creaming for at least 5 minutes. Once the mixture is light and fluffy, keep the mixer on medium and add the cooled flour mixture one tablespoon at a time. Continue to beat until the mixture becomes light and fluffy and resembles whipped cream. Use immediately. To assemble and frost the cakes, level each cake with a serrated knife. Place 1 cake layer, bottom-side down, on a cake plate. Use an offset spatula to spread 1/3 cup of ermine frosting on top. Take one 2-ounce portion of marzipan and grate over the ermine frosting until evenly distributed. Add the second cake layer, top-side down, and repeat the process until all layers have been used up. Frost the top and sides of the cake with the remaining frosting. Use your hands to knead a couple drops of red food coloring gel into the remaining 2 ounces of marzipan until fully incorporated. Roll out the marzipan to a 1/8- to 1/4-inch thick rectangle in between 2 sheets of wax paper. Use cookie cutters to stamp out shapes, and gently press each shape onto the cake. You were certainly were a wise 12 year old, I would be proud if I was the teacher to have such clarity in my students. too! Such a coincidence, eh :)? I've never braved a homemade red velvet cake but this frosting is REALLY speaking to me. this is my first time commenting on your blog, but i just had to. your cake is perfect! such smooth frosting, perfectly sized layers...love it! and that frosting sounds amazing. definitely going to try in the future! I just checked out your post!!! The XOXOs are super darling! Thanks Abby! Happy (early) Valentine's Day! Hahah, I think I still prefer cream cheese frosting, but this frosting's texture was pretty unique. I should have saved you a slice! Thanks Katrina! Happy Valentine's Day too! Maryna, I'm still drooling over your honey cake ;-) I wish we lived in the same place so we could do a cake swap! Haha I love the memories Michelle! I love the look of the cake too- the orange in the frosting sounds like a great way to lift the cake! Yum! The frosting sounds wonderful (I've heard of "boiled frosting before, but I like the name ermine better!) 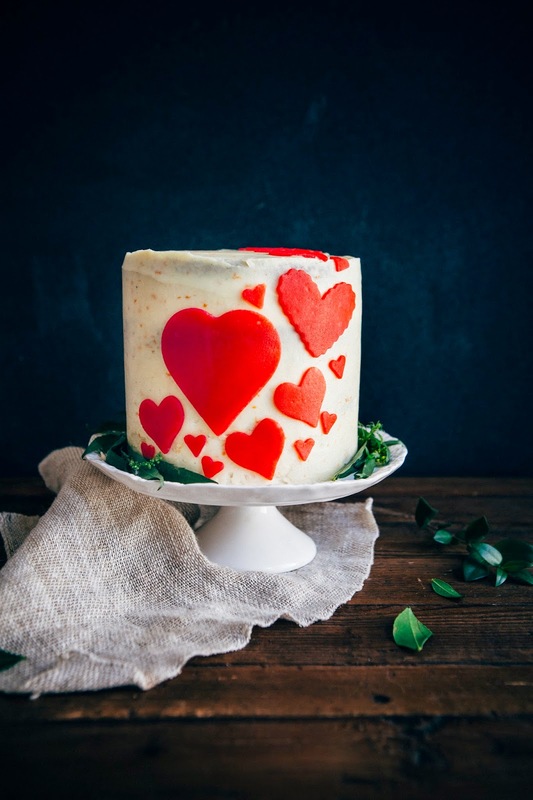 Love the heart decorations...I love how Molly Yeh uses marzipan on her cakes, and I've been meaning to give it a try! 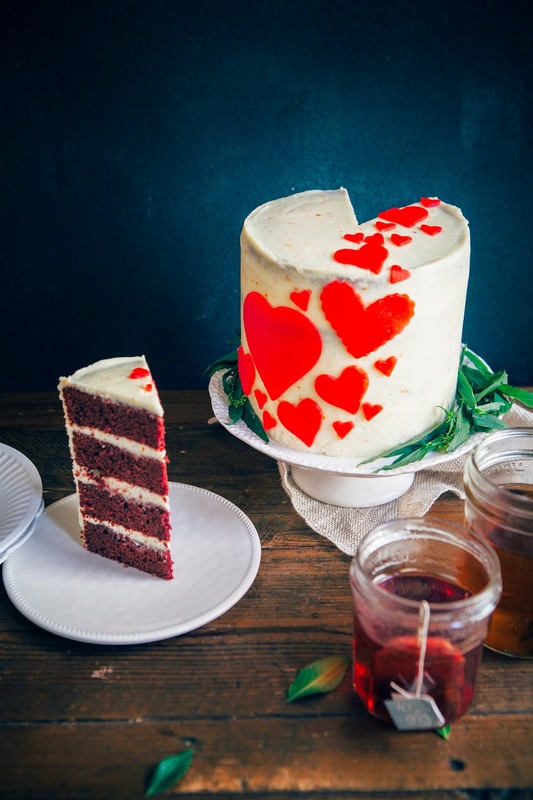 Ah red velvet, such the valentine's classic...I'm glad you changed your opinion on the holiday so we could enjoy this cake :D The red hearts are so cute! 12 year old you sounds a lot like 26 year old me. ;) But let's not talk about that because there is CAKE! I cannot get over those perfect, perfect layers. And the marzipan hearts - swoon. Thanks Millie! I'm always such a fan of throwing in fresh lemon or orange zest into any baked good — I feel like it always gives it a little something, something that people can't quite place. The best recipe for valentines days. Best food and cake ! Thank you! Molly's such a genius, using marzipan instead of fondant to make cake decorations. It's so much easier, not to mention much tastier too! For real; I hate how Valentine's Day is like NYE — so much pressure to go out and spend a bunch of money. Really, I'm happy sitting at home in sweatpants with pizza and this cake. Thanks Dixya! Yeah, I've really come around to vday over the last few years. I think if you think of it as a friends/family/partner appreciation thing as opposed to ROMANCEFLOWERSCANDYHEARTS, it's a much better vibe. Thanks June!!! Happy Valentine's Day! Aw, that means so much coming from you Ashlae! I swear I've been drooling over your baked goods and your blog for the last 3 years or so; the heart sugar cookies you posted up today are on my to-bake list! I love that you tried the Ermine frosting (even if you didn't like it as much as the cream cheese). This cake is gorgeous and surely delicious either way! I hope you have an awesome Valentine's Day! I want ALL THE ERMINE FROSTING. I can't believe I've never heard of it before. This cake = everything in the world that's good about 14th Feb.
Bahahaha. I love your badass 7th grade self. And I love that you've carried that with you through life. I had ermine for the first time this year. Seriously, why did people stop making it?! Geez, this cake is gorgeous. Michelle this is lovely. And wow, at 7th grade, I was definitely not thinking about how commercialized valentines day was. It was more like "Ooh pretty v-day cards I'm going to pass to my BEST friends" type of thoughts for me, heh! Anyways, who isn't inspired by Molly's marzipan cakes? Unfortunately I'm allergic to tree nuts, so I can't use marzipan as a decoration (hence the use of mochi!!!). I had the same situation with macarons, so I determinedly made nut-free macarons so that I could finally see what all the fuss was about, and it was SO GOOD. I think it's about time I came up with a nut-free marzipan recipe!!!!! PS. BEAUTIFUL photos! those bright bright hearts <3. Hah, I couldn't help it! I'm such a food nerd, and reading about red velvet's history topped with ermine frosting made me want to try it — I thought it was going to be perfect! While the texture was cool, turns out I'm a modern girl and I just want straight-up cream cheese frosting. For real! I guess it's easier to make buttercream and cream cheese frostings, but seriously, let's bring ermine back. GIRL, I was drooling over your mochi hearts on instagram the other day. So excited, can't wait to see what you do for a nut-free marzipan. Also, I'm intrigued by your nut-free macarons — heading to your blog to check it out now! The frosting LOOKS gorgeous even if it is a little lacking in cream cheesy goodness! Cream cheese IS pretttttty hard to beat! 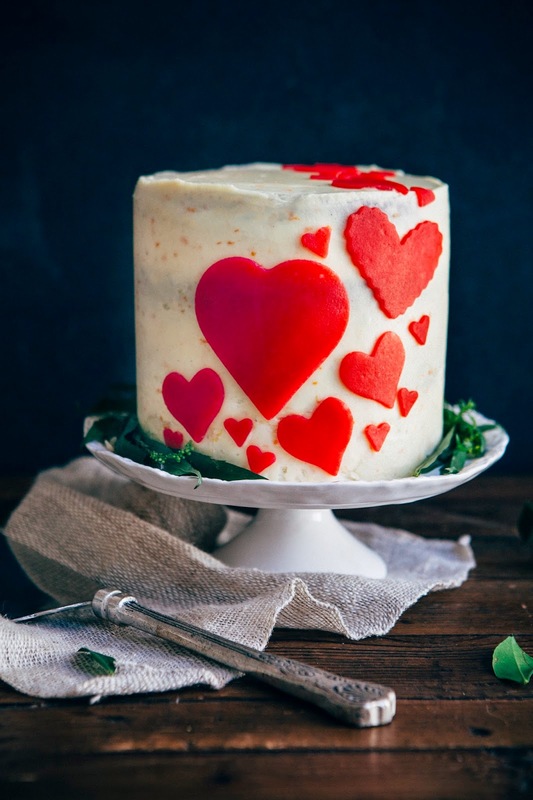 Also, I'm loving that you've decided to embrace Valentine's Day -- I think as a baker it's pretty hard not to give into the one day where we can be as heartsy & cutesy as we please. :) Oh, and Celeste's photos are stunning! Ermine frosting sounds so so dreamy, Michelle! (And also cute, because it reminds me of these dudes: http://i.imgur.com/rzXjUkS.jpg awww) You have had such a long journey with this red velvet cake! I'm loving all the cake-places it's taking you -- this one looks SO decadent and amazing. And the hearts are too too cute!! Hope you guys have a fantastic day tomorrow :D (omg, sweatpants and Papa J's is MY DREAM V-DAY). Love this!! whoa. I did not know that was going to show up like that. Hahah, I think the frosting was named for this animal!!! So glad that you dropped this image in here, it really made my day! It's so cute!!! This is a really beautiful cake. I've never had ermine frosting. I'm super intrigued now! Hope you are having a great weekend. Happy Valentine's Day! My relationship with Valentine's day was all love as child, then hate as teenager, and now like + a little meh. It's a sweet and silly holiday. A holiday that should be spent with loved ones, eating whatever inspires ... love! That's pizza for you and Erland...buffalo wings for me and my sweetheart. I also justify having buffalo wings on Vday because buffalo sauce = red = love = Valentine's Day...? I have never heard of any frosting on a red velvet besides cream cheese frosting! I can't wait to try it, thanks for sharing your research!